It would take a good-sized book to adequately cover all aspects of lumber as it applies to boat building alone. However, a chapter devoted to lumber covering the basics that the average amateur will need to know is probably just as valuable, since the boring technicalities and scientific aspects that tend to confuse more than to clarify can be dispensed with. After all, the point in discussing lumber is to provide knowledge to help the builder select, buy, and use the proper types of lumber for the particular boat that is being built; not to provide a scientific or technical foundation. With a little practical information, the novice will be better equipped to go to his lumber dealer. To know how to ask and receive exactly what he will need for the best possible price and rest assured that his boat will be built with the most suitable materials for his special application. It is impossible to cover all types of lumber that are available for boat construction. Each part of the country not only has certain woods that will be common to the area, but there usually will be several imported lumbers available as well. When in doubt about what type of lumber to use, a general rule to follow is that any lumber that has been proven successful in similar boats in the locale can be used. However, if the designer of the boat specifies certain types of lumber, especially where light weight, or high strength, or decay resistance characteristics may be important, try to substitute woods that will be equally matched to such requirements. For example, on a high speed runabout where a designer might specify the use of Sitka spruce (because of its light weight), it would be foolish to substitute with a wood such as white oak (which weighs nearly 65% more than Sitka spruce). Even though both woods are suitable boat building lumbers. Such a substitution would not only make the boat much heavier, but performance could be disappointing. From an economy standpoint it is usually less costly to buy those lumbers that are readily available in the general area even though the designer of the boat may have specified another type of lumber not available. Here again, woods of similar weight and strength characteristics that have been proven in use in the area can always be substituted. After all, the designer cannot be expected to specify all the suitable alternatives, especially when he may be located in another part of the country where such woods may be unfamiliar to him. Probably no aspect of the boat building project causes more initial confusion for the novice than that of attempting to buy lumber. And yet, with the understanding of a few basic concepts, the process can not only be simplified, but can even be interesting. The first mistake to avoid is to grab the plans for the boat or a copy of the I bill of materials, immediately rush to the nearest lumberyard, and then give the listing to the man at the lumberyard for a quotation. This is a sure way to waste money. First, understand how lumber is measured and sold. Lumber is usually sold by the "board foot". A board foot is a measure of size equal to 12" x 12" x 1" thick, or 144 cubic inches of wood. With every board foot of lumber charged, you will be paying for this amount of material. However, this does not mean that you will actually receive this much material. This is because that when the tree is cut down and sawn up, the lumber will be in a rather rough form. To make the lumber suitable for use, this rough board (which may be 1" in actual thickness at this point,) is decreased by the milling or surfacing process to where it will be less than the initial rough thickness. Usually such milling will remove from 1/8" to 1/4" from the board, but the customer still pays for the "sawdust" lost through milling. Almost all hardwoods are sold as "random-random" material in the rough. This means that lengths and widths will vary. Thickness of such material is specified in "quarters", with each quarter being 1/4". Thus, "four-quarters" material is 1" in the rough state, "five-quarters" stock would be 1 1/4", etc. Commonly available rough thicknesses are 4/4, 5/4, 6/4, 8/4, and 12/4 stock, or 1", 1 1/4". 1 1/2", 2", and 3" respectively. After the rough lumber has been milled or surface planed to be smooth on two sides, it is given the designation "S-2-S", or surfaced-two-sides. In cases where completely milled lumber is available, it is given the designation "S-4-S" to show that not only have the two surfaces been milled, but the edges have been jointed square and smooth as well. Normally, S-4-S lumber will be more costly than S-2-S lumber for the same species. Lumber with the S-4-S designation will often be less in the width dimension as well, due to the fact that some material will be lost when jointing the edge. Hence, not only in such lumber more costly than the same type in the S-2-S grade, but the result will be even less wood per board foot paid for. A deviation to the above lumber measuring system comes with softwood lumbers such as Douglas-fir. These types are commonly sold only in S-4-S grade, with both dimensions actually less than that that they are designated by. For example, a Douglas-fir member that is specified as 2" x 6" will actually net less in both dimensions by virtue of the grading standard under which softwood lumbers are measured. It would be common to find the actual net size of such a 2" x 6" member to be 1 1/2" x 5 1/2". This variation with softwood species is common for all standard size designations and should be allowed for when purchasing softwood lumber types. These lumber types are also commonly sold by the lineal foot for convenience in some lumberyards that can increase the buyer's difficulty in determining the cost per board foot in order to compare costs with hardwood lumbers. For example, a 2" x 4" Douglas-fir member priced per lineal foot contains only 2/3 board foot. In buying lumber for the boat building project, the builder must first determine just what thicknesses of materials will be required. When the designer notes that a given member should be 1" material, does he mean that the material will actually NET 1"? Or does he mean for the builder to purchase "four-quarters" stock? The designer should note somewhere on the plans or material listing just what is meant by the noted lumber thickness. 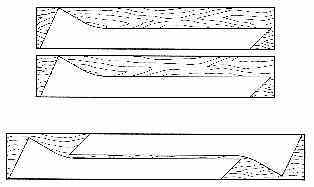 The lumber thickness is usually the first dimension noted for a given member and is often called the "sided" dimension. From a practical standpoint, as well as making the purchasing easier, the designer should preferably specify standard lumberyard dimensions. That is, 1" material will actually refer to "four quarters" stock that will be milled or "sided" as full or thick as possible. In this case, the stock could range from 3/4" to 7/8" in actual milled thickness, and the designer would have made allowances for this variation in his scantling decisions. If the lumberyard is in a position to mill all stock on order, specify that milling should be as thick as possible AND that it should be uniform. It can prove exasperating to work with, say 1" stock, that varies in net thickness by several fractions of an inch. If the lumber has already been milled, check the thicknesses when buying to assure that there is little or no variation in milled thickness. If, on the other hand, the designer means for such 1" material to actually be 1" NET in thickness, this would mean that the lumberyard would have to take the next thickest material (in this case "five quarters" rough stock) and then mill it to the 1" NET thickness. As anyone can quickly see, this would amount to 25% more lumber (1 1/4" as opposed to 1" stock) paid for, that would be wasted as sawdust. Plus the additional cost of custom milling the thicker stock to the specified net thickness. So unless the designer specifically notes that material will be to "NET" size, assume that lumber is purchased in the standard lumberyard thickness, and specifically note this to your lumber dealer when seeking a quotation. PLATE 5-A: Using material wisely can reduce costs considerably. For example, "nesting" of frame members with deep contours using wide stock will result in far less waste than using widths of stock that allow only one member from a given length of lumber. In the example, a board only slightly wider and longer yields the same number of pieces from considerably less material. could be obtained that was a little over 8" in width, then two such members could be taken from one length. Also, when wide deeply contoured frame members are necessary, it is possible to "nest" several such frame members within one width resulting in less scrap and lower material costs (see Plate 5-A). Obviously, some planning on the part of the builder will be required to take advantage of all these variations, but the savings in costs can be considerable. Once the builder has grouped all his lumber together and has carefully analyzed his bill of materials, or has determined what materials will be required, if the designer has not provided a bill of materials, he can go shopping. The first rule in shopping for lumber is to shop around for the best value. Note that we did NOT say shop for the best "price", since there is no such thing as a good "cheap" boat building lumber. In other words, lumber that might be half the price of other similar lumber, but that is full of defects, could wind up costing twice as much by virtue of wasted stock. This does not mean that special "close-outs" at favorable prices cannot be found and utilized, but the novice should be especially aware to avoid comparing lumber like "apples" with "oranges". He may end up with "lemons" instead. Many boat building woods cannot be found in ordinary lumberyards. Then too, some lumberyards are more adept at merchandising lumber for boat building than others. It is easier, of course, is to find the proper lumber in areas where boat building is done. However, this does not mean that suitable sources cannot be found in other areas, even those that are far inland. This is because many boat building woods are used for other purposes. It is not uncommon, however, for lumberyards to ship lumber a considerable distance and to work on a custom-order basis, even with individuals building their own boats. When suitable sources cannot be found by utilizing the "yellow pages" or through local channels, a check with the advertising sections of the national boating magazines will usually reveal sources of boat building lumbers and related materials. However, in selecting any sources of lumber, be sure that you understand all of the cost figures, including any "hidden extras" like shipping the delivery, milling charges, bundling fees, etc., before purchasing. Experience has shown that through careful purchasing, a difference of as much as 50% in the total material cost of the hull can be realized.